Srinagar,July 10, (Scoop News)-Continuing with his Visit to the Valley, the Northern Army Commander Lt Gen Ranbir Singh accompanied by the Chinar Corps Commander Lt Gen AK Bhatt visited the Army formations and units deployed for the Amarnath Yatra and took stock of the security and administrative arrangements for the ongoing Yatra. He stressed upon the need for close coordination with Civil Administration to ensure a smooth and efficient conduct of the Yatra. The Army Commander appreciated the synergy being maintained amongst all security agencies for conduct of the Amarnath Yatra. Later in the day, the Army Commander visited forward posts in the frontier district of Baramulla wherein he was briefed by the commanders on ground regarding the operational and logistics preparedness. 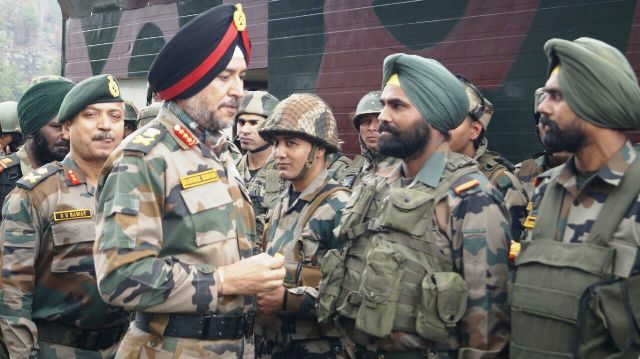 Commending the exemplary professionalism and high morale of the troops deployed along the Line of Control, Gen Ranbir Singh stressed upon the need to maintain sustained vigil to thwart any attempts of infiltration from across. The Army Commander also reinforced the need to be prepared to meet emerging security challenges effectively.